Invitation of rate of interest from public, private sector Banks & corporate bodies of Varanasi for the investment of surplus funds of BHU.For details click here..
84th Annual Meeting of Indian Academy of Sciences, 2nd November 2018 — 4th November 2018 at BHU, VNS. भारत वर्ष के महान सपूत भारत रत्न डाo भीमराव आम्बेडकर के १२७ वें जन्म दिवस १४ अप्रैल 2018 को पूर्ण सम्मान एवं आदर के साथ मनाने से सम्बंधित..
Notice for last date and some important informations related to Diploma in Languages and others (2017-18) offered by Faculty of Arts. Revised dates of Mid-semester break will be from 25.09.2017 to 02.10.2017 (for students only), examinations scheduled during 25.09.2017 to 27.09.2017 will be held as earlier notified schedule..
Last date for submission of UG/PG Diploma forms for languages of Faculty of Arts, BHU (online & print form) has been extended up to 23.09.2017 For details, visit bhuonline.in. Ph.D./Vidyavaridhi admission in the Semester Commencing in March'17-reg. 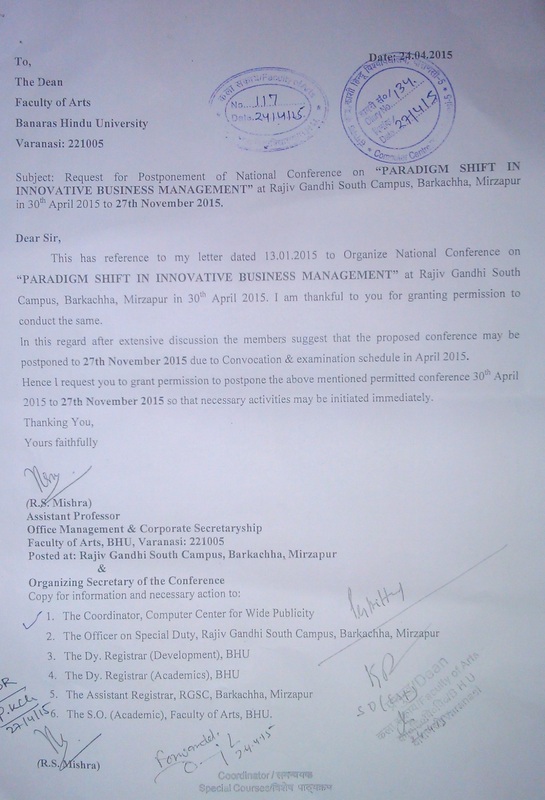 Examination for SNCU positions under Scheme No. 5064 at Department of Paediatrics, IMS is postponed till further Notice. Candidates are requested to check the BHU website regularly for updated information. Notification regarding admission to class "LKG" in Central Hindu Girls' School(K) for the academic session 2017-2018..
Notice regarding Prof. CNR Rao Award for excellence in Science Research. For details click here..
Advertisement for registration of security agencies for supply of ex-army men to the University. Ph.D/Vidyavaridhi admission in the semester commencing in March'16-reg. हिंदी सप्ताह -2014 के अंतर्गत आयोजित प्रतियोगिताओं के विजेता प्रतिभागिओ एवं हिंदी में उत्कृष्ट कार्य करने वाले कार्यालयों एवं कर्मचारियों की सूची . Notice regarding allotment of different University residential quarters. 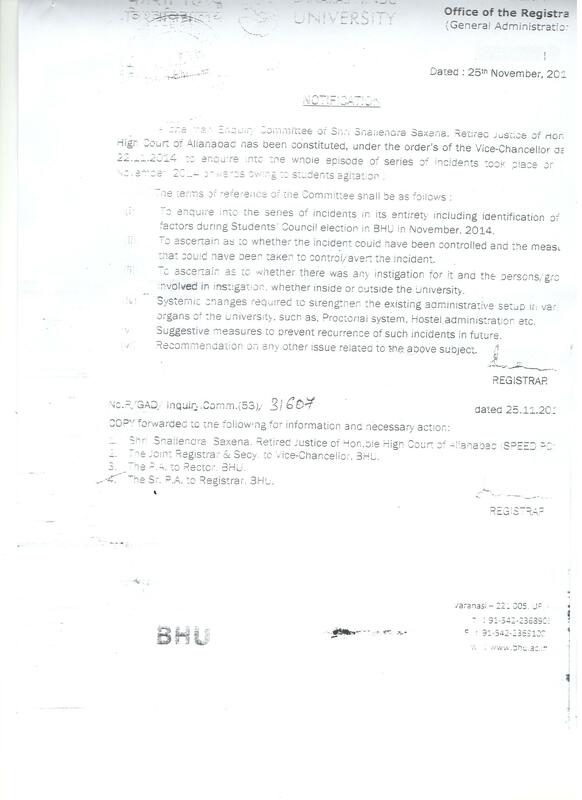 For details click here..
Notice for the student of BHU for the enrolment into NCC. For details click here..
Notice regarding partial modification of notification No. 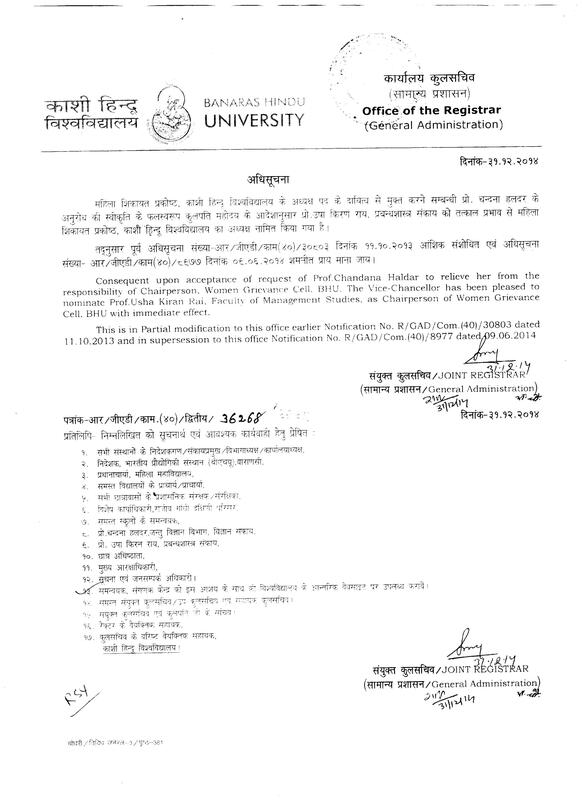 R/GAD/PPP Cell Estab./4152 dated 29.04.2013, it is notified that in view to modernize BHU Press... "
Notice regarding setup an " Education Technology Cell (ETC) in the University for development and maximum utilization of ICT in teaching, learning process, administrative, and dissemination of knowledge "
Notice regarding " Promotion of ministrial/secretarial staff and drivers of the university "
Notice regarding "Six Work Day per Week system in Sanitary & Support" "
Notice regarding "Supernumerary seats under employee ward quota" in the courses conducted by the University and Admission to which is made through UET/PET"
Notice regarding "Address of Grievance Redressal Cell"
Notice regarding "Deduction of VAT on payment to seller"